And here are the current league standings as of round 1. A quick thought---and my heart goes out to our own PasarChino! for this one---you gotta start Rimando, buddy! You sat the highest point total in the league. Ouch! As for our crew here at ASA, most of us (Jacob, Drew, Jason, myself and poor Bill) did okay, with the most notable stand out of the bunch being Cris Pannullo and a bit farther down Chris Gluck. We'll head to the next round and see if those two can distance themselves from the rest of the ASA community. Again, this is for an undisclosed, not-yet-valued prize that is available to all whom play. It could be a Meatloaf interactive blu-ray, it could be a soccer ball, it could be a scarf of your choosing. Matty might spend a couple hours on Skype teaching you how to use R. Who knows what we'll come up with. The only promise is that it won't be terrible. Code to enter is 9593-1668, should you care to join in the fun/recklessness that is fantasy sports. The three teams that are noticeably absent this round are Columbus Crew, DC United and LA Galaxy. I'm sure this will kind of cause a bit of reshuffling to occur as many, including myself, had been sporting Robbie Keane as their captain, and it will most certainly require some movement along the bench. But this is where you earn the coveted prize. No, not the Sheva, though I'm sure we can come up with an equally inspiring annual trophy name. 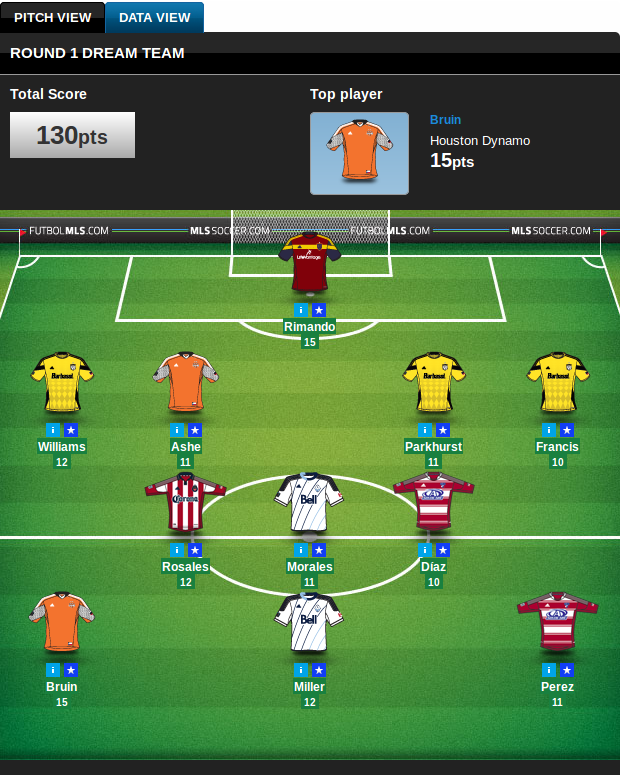 I'm sure you all have better advice/thoughts than what I have for MLS fantasy, so I'll point you towards a couple of sites that have some stats and feed back on last week. - Mr. Fantasy, Ben Jata, recaps the hap's with round 1. - Big D Soccer does a nice preview of not just Dallas FC players but also some thoughts on MLS as a whole. - Sticking with the Texas theme, Dynamo Theory has some fantastic numbers/stuff that deserves recognition for their work. Great job by TraviTheRabbi and I would say give him a follow on twitter but I don't see any such thing connected to his account, and that makes me a sad panda. Anyways...go read the article here. Solid, solid stuff. I leave you with the current top-50 hottest players being selected as of 10:30 last night. I've equipped you to make some good decisions. Now go forth and conquer. The catch is that only one of you will win. Anyone have any top secrets for how they plan on winning the league? I hear finding people that stop goals and in return score goals are really good to have? Any other methods or suggestions?